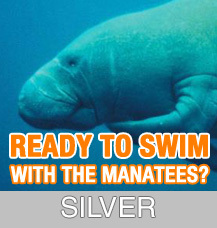 Introducing the Crystal River Manatee Swim & Snorkel Tour. 7AM and 10AM – Swim with manatees in the Crystal River, the highest concentration of manatees worldwide! Upwards of 600 manatees visit the Kings Springs each winter. This boat is covered and warm. Manatee Tours conducted year around. The most comfortable tour boat in the area. Oversized restroom. The Miss. Riverside II offers a spacious interior with plenty of elbow room. Manatee tours conducted 7 days a week, year around. Our summer manatee tours depart at 7:00 AM and 10:00 AM. During the late spring, summer, and early fall the manatees are most active in the early morning hours. $50 includes mask, snorkels and wetsuits. 35 and 16 passenger boats are available for groups only. Book for a Gulf Sunset cruise, Private Party, Kings Spring Swim Party, Weddings, Funerals, Corporate Functions, Business Lunches, Birthday Parties, Bachelor Parties, Anniversary Parties, Graduations, Retirement Parties, Class Reunions, Field Trips, Nature Cruises, Family Reunions, Singles Groups, Ethnic Associations or Groups, Business After Hours Cruises, or any other form of entertainment you may choose on the Crystal River.